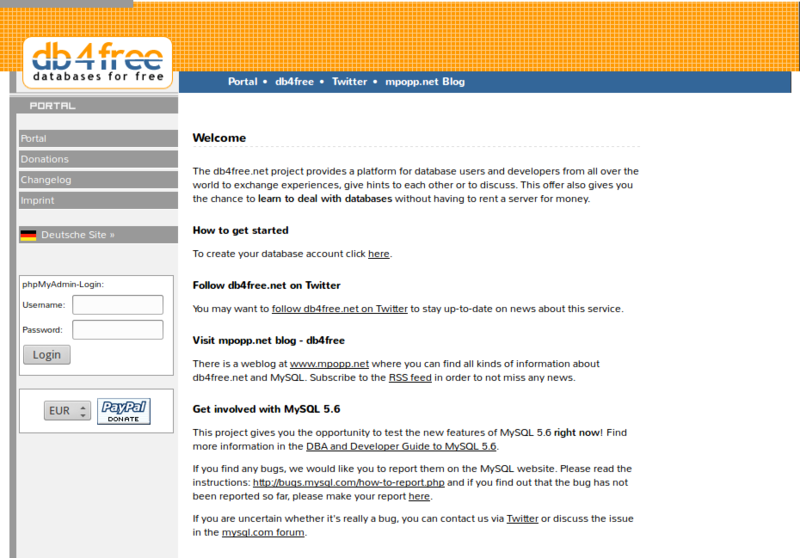 db4free.net was born in 2005 (which makes it older than Twitter or Google Chrome) when MySQL 5.0 was in early development. 11 years went by but one thing always remained the same: the 5 in MySQL’s major version number. MySQL versions went from 5.0 to 5.1 to 5.5, 5.6 and recently to 5.7. There was always this 5.something. While this 5 will stay around for a bit longer, it is not alone anymore. where you can create a database on a newly set up MySQL 8.0 server! MySQL 8.0 is in very early development, the first Development Milestone Release (MySQL 8.0.0 DMR) has just been released on September, 12. It will take several months until there will be a final release. db4free.net makes it easy to try new features early. The MySQL 8.0 Reference Manual is a good entry point, especially the section What Is New in MySQL 8.0. While the MySQL 5.7 server keeps running unchanged, the new MySQL 8.0 server will run on port 3307. Make sure to address the correct server in your client. Maybe there is a separate field to set the port, or you may have to change the host name to db4free.net:3307. Of course you can also use phpMyAdmin at https://mysql8.db4free.net which will give you access to the MySQL 8.0 server (while phpMyadmin at https://www.db4free.net will still connect you to the MySQL 5.7 server). Speaking of clients, please keep in mind that clients may not be fully ready for MySQL 8.0 yet and there may be a problem here and there. This is part of testing a new version in early development. The mysql8.db4free.net website with black-orange header is mostly a duplicate of the www.db4free.net website with black-blue header. The only major difference is that mysql8.db4free.net manages databases on the MySQL 8.0 server whereas www.db4free.net manages databases on the MySQL 5.7 server. Accounts created on either site do not affect the other site, so they are completely separate. If you want a MySQL 5.7 database as well as a MySQL 8.0 database you need to register on both sites. db4free.net now accepts donations in Bitcoins. Donations in traditional currencies are also supported via PayPal. 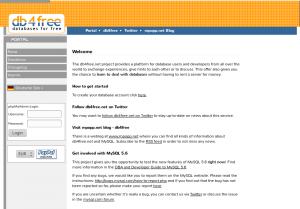 db4free.net finally runs MySQL 5.7 which was released on October 21. Rather than upgrading the existing MySQL server I set up a new MySQL 5.7 server. This is cleaner and it helps to get rid of accounts which are no longer used. You can access it on port 3307 (the new MySQL 5.7 server will again run on MySQL’s default port 3306). You can also use phpMyAdmin (there are now 2 login boxes) or MySQL Workbench or any other client software which does the job. Please remember: db4free.net is a testing service. Data loss can happen any time! The primary reason why not data loss occurred in the last 2 years (how time flies!) are the many stability and bug fix updates that MySQL 5.6 received over time (current version is 5.6.27). There were some problems while MySQL 5.6 was young though! With MySQL 5.7 being a new major release (current version is 5.7.9), the risk of data loss and outages will again be higher. Please take this into account (backups, backups, backups!). It’s the price for the shiny new features. Since db4free.net is a testing service, this shouldn’t be a problem for you. If it is a problem, db4free.net is probably not the right service for you. Finally! 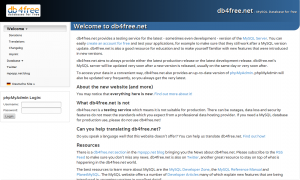 The new db4free.net Website has launched and along with it comes a new (slightly stronger) server and some simplifications with the service itself. The service now has a few simplifications. It is no longer allowed, or necessary, to set a collation and define IP addresses or hosts from which db4free.net can be accessed. Most users didn’t change the default anyway and many who did locked themselves out. As for character set and collation, UTF8 should work fine in all languages. If you really need to change it, you can do so from your MySQL client. You can fork this repository, fix texts and/or add translations and send a pull request back, so your updates can be integrated into the website. Find instructions how to do that in the new Translation page and if you need further assistance, please open a ticket at GitHub. I will be happy to guide you through the process as good as I can. 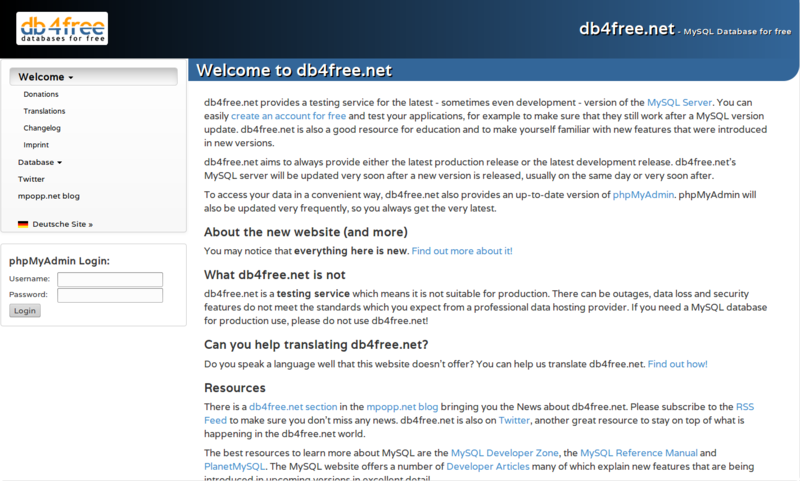 Also still quite new is that db4free.net is now on Twitter. Please consider following the account so you can easily stay up-to-date. Where is your data which you had already stored in a db4free.net database? As like the last time when db4free.net moved to a new server, the old server and service will remain available at db4free.org until August 15, 2014. Since the migration process is exactly the same as last time, please reuse the good old and still valid instructions. If you have any questions, please use the Comments section below or drop me a line on Twitter. Enjoy! db4free.net‘s server has reached its limits, and it was time for a new one. Now here it is, a shiny new server, with 8 times as much memory than the previous one, and also more disk space. Time for a reboot. Only recently, MySQL 5.6 has become GA with much better performance than 5.5 and earlier, so the combination of a faster MySQL server and a faster machine should result in a very significant performance boost for db4free.net. I have not migrated any user databases, but they are still available on the previous/old server. The old server is available at db4free.org, the new server at db4free.net. I will leave the old server running until end of March to allow users to transfer their data to the new server. After that, the server will be shut down and db4free.org will point to the new server as well. This way the server will not have to carry the load of thousands of databases and user accounts which have been created over time and are no longer used. On Linux, make sure you have the mysql-client package installed. This should give you everything you need. For Windows users I am providing the 2 client programs you need for download: mysql.exe and mysqldump.exe. Download and copy them into your Windows directory (C:\WINDOWS usually). [myuser] is of course your user name, [mypass] your password (note that there is no space between -p and your password) and [mydatabase] your database name, as used on the old server. Note that while mysqldump used db4free.org as host name, you need db4free.net for the mysql command. User name, password and database are those from the new server, in case you used different ones when registering for an account on the new server. If you prefer phpMyAdmin, you can still access the old server at http://www.db4free.org/phpMyAdmin/. Should be easy enough, I hope. And when it’s all done: enjoy! In my role as Web Developer for mysql.com I have always tried to advocate open web standards, and to adopt good new web technologies as early as possible. And I believe that an open source product like MySQL owes the World Wide Web open web technologies, rather than content which requires proprietary plugins. Which is why it’s a pleasure for me to tell you that demo videos which used to require Flash have been replaced by new demo videos which work with HTML5 video (and using Flash only as fallback for old browsers). … or even better, take a look at the real thing at http://www.mysql.com/products/enterprise/demo.html. Needless to say, not only the fact that these videos are delivered as HTML5 video is interesting, but of course also what the MySQL Enterprise Monitor can do for you, like analyzing your queries, or monitoring your replication and alert you when things go wrong. And stay tuned, there is more to come in the future! db4free.net is joining the protest against SOPA & PIPA and will stay down for 24 hours, starting January 18, 2012 at 02:00 UTC. … or watch some of the many videos related to SOPA on YouTube. Noticed the new navigation item in the MySQL Developer Zone? A nice extra to the implementation at dev.mysql.com is that it uses HTML5 audio, so provided that you are using a technically up-to-date browser, you can not only download the sound file of an episode, but play it right in the browser. No plugin required. Today, December 15, 2010, MySQL 5.5.8 was released – and is now generally available. db4free.net has been updated to 5.5.8 GA.
Read the Introduction to MySQL 5.5 to find out what’s new and … give it a try! One month ago I set up a new MySQL 5.5 db4free.net server instance, after the old instance started to keep crashing. Since then, the former user database server has run on port 3307 to give people a chance to rescue their data, while the new MySQL 5.5 instance started completely from scratch. However, most of the time, the 3307 server was down and I doubt that many people had a chance to get a copy/backup of their data. Now I updated that server to MySQL 5.5 as well. It’s too early to tell whether or not that will increase people’s chances, but it may be worth to give it a new try.